A couple of people have submitted information about this group. It is believed to be Jim Boyd and his Men of the West, a group based in Dallas, that was doing a personal appearance in Houston, judging by the station call letters on the microphone. 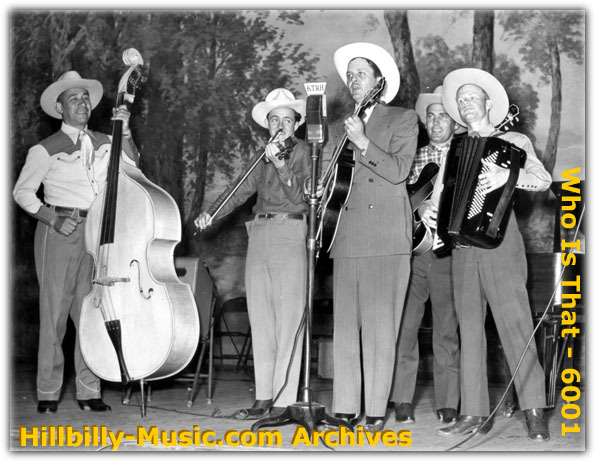 The folks in the photo are, from left to right: Freddy Casares, bass; Billy Jack Saucier, fiddle; Jim Boyd (at the microphone), guitar; Jake Wright, guitar; Red Gilliam, accordion. Our initial supposition that two of the folks in the group were a couple of the Farr brothers appears to have been wrong. Hillbilly-Music.com wishes to say 'thanks' to Kevin Coffey for helping us identify the folks in this photo.